Cecily has been a long-time friend of the bar. On January 27th, 2019 Cecily was admitted to Kaiser’s Urgent Care after 8 months of pelvic/abdominal pain/discomfort and numerous doctors visits. What was expected to be a quick visit turned into an overnight stay for a CT Scan, blood work, urine samples, fluid drain, and two ultrasounds. Her testing revealed a 6.8 cm, semi-solid mass on her left ovary and a cluster of enlarged lymph-nodes around her kidney. She was referred to a gynecologic oncologist and on January 30th, 2019 Cecily received the life-changing diagnosis of Serous Ovarian Cancer, Stage 3. Cecily is just 29 years old. Since her diagnosis, Cecily has received three rounds of chemotherapy at Kaiser Permanente. Her treatment plan moving forward is a total of six chemotherapy rounds as well as a total hysterectomy in May. Genetic testing has also revealed that Cecily has a BRCA1 mutation which leaves her at an increased risk of breast, ovarian, and pancreatic cancers. Unfortunately, Cecily does not earn health insurance from the multiple jobs she works to support herself. She has had to cut her work hours down to 20 hours a month and is now relying on family members for financial support. She has emptied her savings account to pay for treatment up until this point but she has a very long road ahead of her and the financial burden is overwhelming. Her family and friends are coming together to try and help. This fundraiser will have jello shots, a raffle, and silent auction (cash only). Proceeds from Hellbent Brewing beer sales will also be donated. Cash donations accepted as well. All funds raised will go towards medications, office visits, her monthly bills, and living expenses. DJ Killa B will be providing music. Wigs are encouraged to show support! 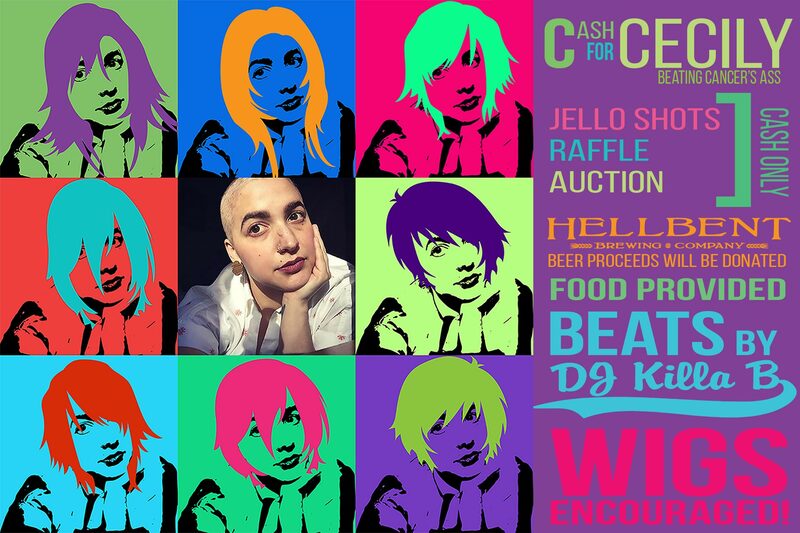 If you can’t make it to the event, you can donate directly on Cecily’s GoFundMe campaign. To know Cecily is to be inspired by her. Her positive energy and loving spirit touch all who have the pleasure of meeting her. She is fighting this diagnosis with vigor and humor and remains positive and hopeful for the future. Any and all help is appreciated. Check back for more auction items!